Have I mentioned we watch a lot of sports in our house? I feel like it’s a bit of theme around here. 🙂 When our oldest showed no interest in sports whatsoever, I know my husband was a little bummed out. So now he’s more than making up for it with Henry and even Charlie. Our collection of sports equipment is getting larger. We have two basketball hoops (one inside and one outside) that get regular use. We are going to have to invest in a real one for the kids to use pretty soon. The boys call it “education” when a game is on TV, but I think they are trying to pull a fast one on me. 😉 March Madness is on and our brackets have been filled out. In anticipation of the glut of basketball watching that will be going on over the next few weeks, I put together a simple party. The theme is easy and casual. 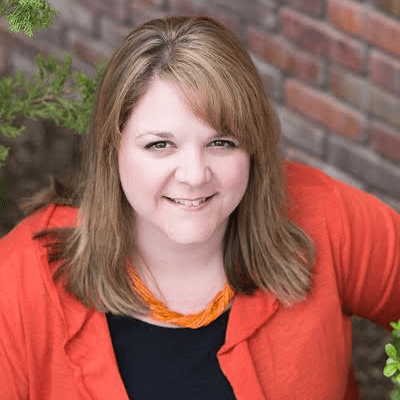 Hosting a party doesn’t have to be a complicated event! Just call some friends and save a spot on the couch! I know, I know. This is a basketball party. What are these cupcakes doing here? 🙂 Remember I said the theme here is EASY? You aren’t going to believe how easy these are to make. You only need four ingredients and you have a sweet treat that’s easy to grab and munch on while you cheer for your team. Mix the cake mix, soda, and juice together in a bowl. Stir smooth with a spoon. DO NOT ADD EGGS OR OIL! After the batter is smooth, stir in the chocolate chips. Pour batter into cupcake liners and bake according to package directions. After cooling, frost with your favorite vanilla frosting and top with a maraschino cherry. For those who are less interested in actually watching the game for the pure love of the sport, I created a little basketball bingo card to help pass the time. 🙂 Just print both cards out and separate into teams. (The printed PDF will not have my watermark.) Each card has the same things to look for but they are in a different order. Mark things off as they happen and the first team to get five in a row wins! 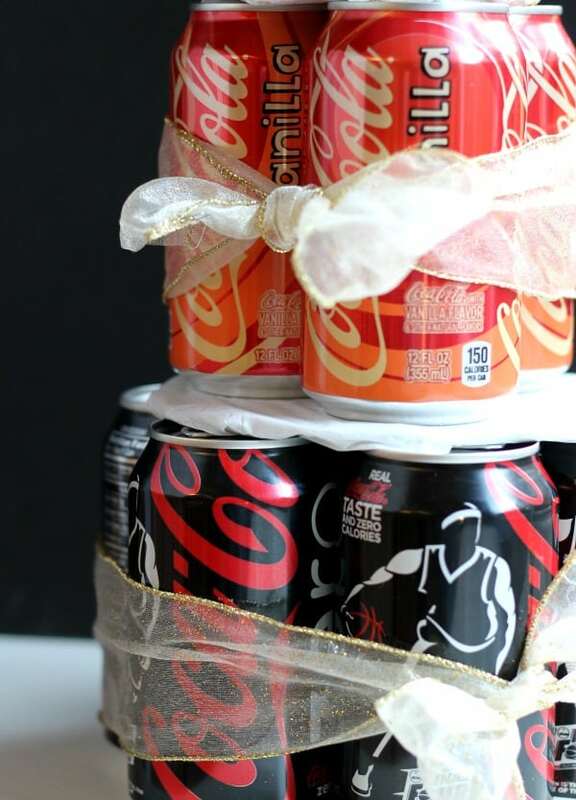 To dress up my party table just a little bit, I created a Coke can cake. It’s a fun little tower of deliciousness. 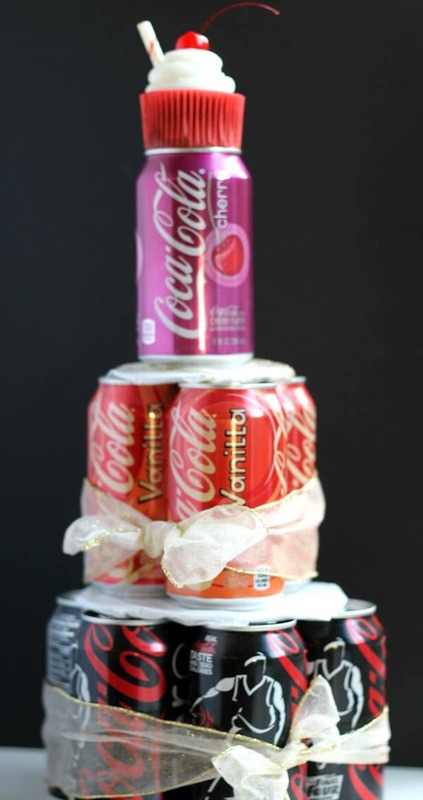 Everyone knows my deep love and commitment to Diet Coke, so I know I would be thrilled with getting a cake like this for my birthday. 🙂 It’s super easy to make one of these, and you can do it with as many cans as you’d like. 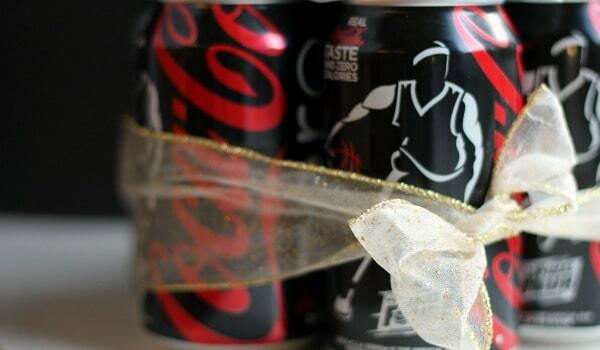 I started with 5 cans of Coke Zero for my bottom layer and wrapped a pretty ribbon around them to help hold them together. Then I cut a circle out of cardboard just slightly smaller than the top of the Coke Zero layer and wrapped it in tissue paper. I secured the paper with a little packing tape to hold it in place. Place the cardboard circle on top of the bottom layer and then create your second layer of cans. I used three cans of Vanilla Coke for my middle layer. Place the second layer on top of the cardboard to keep it steady. So far, so good! 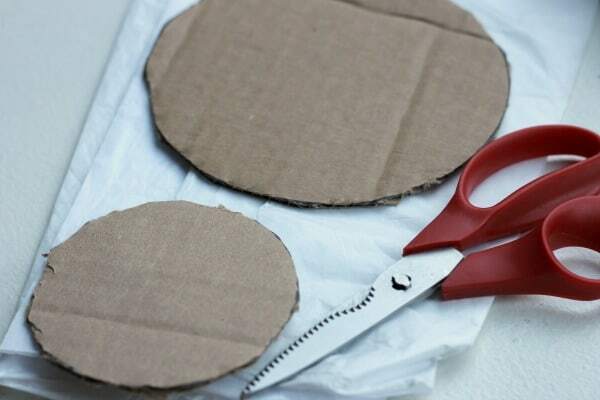 Cut a second circle out of cardboard, wrap it, and place it on top of the middle layer. The final layer will go on top of that one. I topped my “cake” with a can of Cherry Coke. I topped my can cake with a tasty treat. 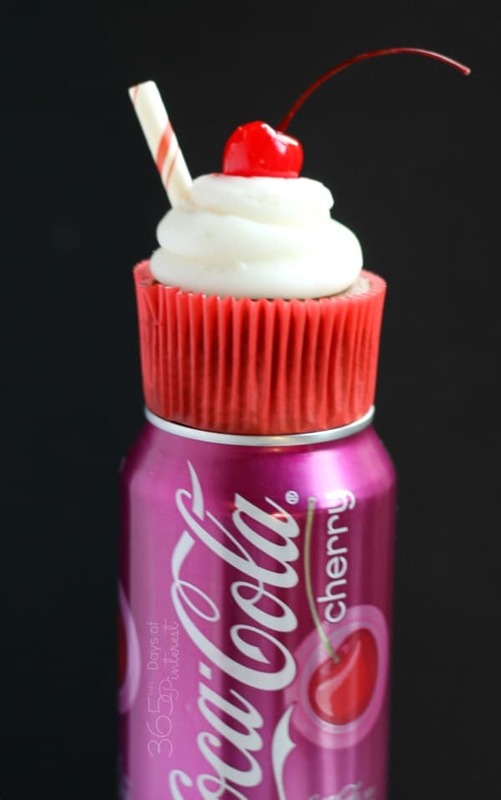 The Cherry Coke Cupcake fits perfectly right on top of the can of Cherry Coke. It must be fate. There you have it! Quite possibly the easiest little shin-dig you ever put together, but still fun and memorable for everyone! This post was originally sponsored by Collective Bias and its advertisers. All opinions were mine alone. 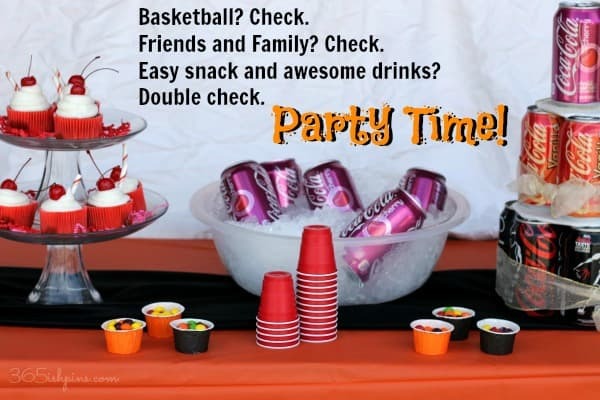 What a great game day party idea! Love those yummy cupcakes!!! 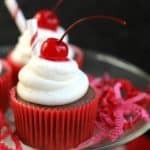 These cupcakes look SO good, pinned! The party looks so fun too, love the Bingo card. What a fun bingo game! This is totally awesome! I want some of these cupcakes now! 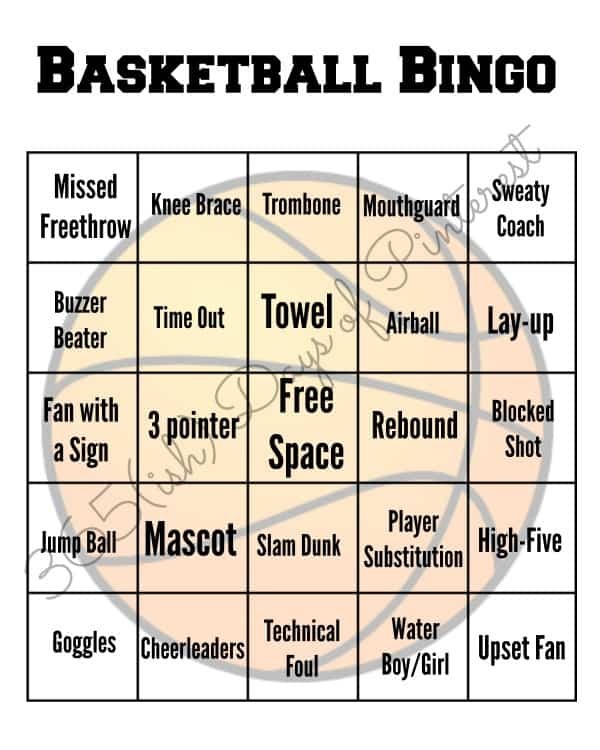 Basketball bingo? That sounds like fun! WOW so many Coke flavors!!! I love your cupcakes!!! A must try!!! 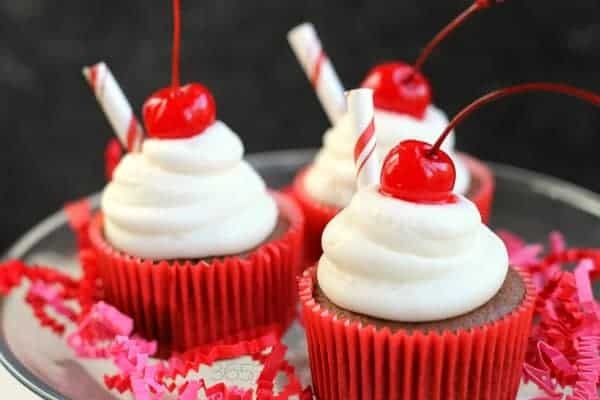 I love shortcut recipes like these cupcakes. They look – well – simply perfect! Those cupcakes look delicious!! 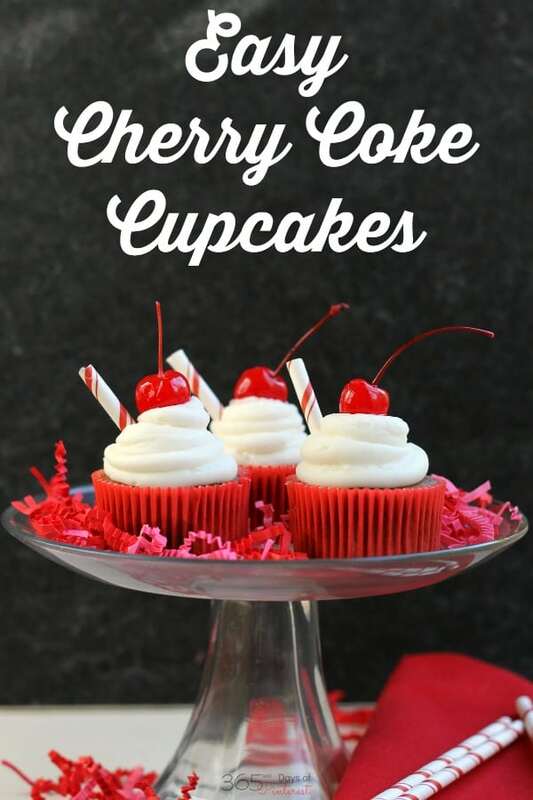 I’ve actually never used soda in my cupcakes before…I’m going to have to try this! That was new to me, too, but it’s ALL OVER Pinterest! 🙂 I think a “from scratch” cupcake is still best, but when you are shooting for easy, you just can’t beat these!